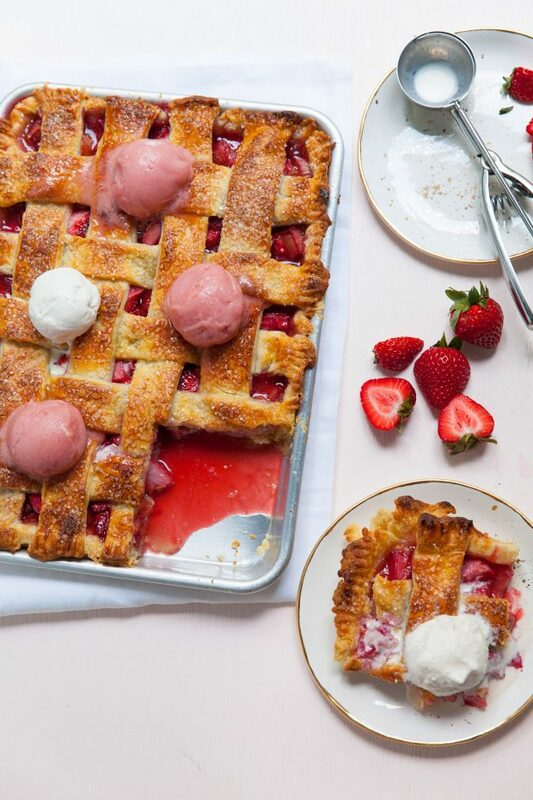 Where has strawberry rhubarb pie BEEN all my life?! 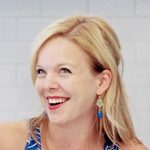 Somehow I made it into my thirties before I was even exposed to rhubarb. I suppose in part it is due to growing up with a dad raising us three kids on his own. While he did a commendable job feeding us homemade and semi-homemade meals every single night, I don’t recall him ever baking anything. Even though I wasn’t the most adventurous of eaters as a child, I’m fairly certain I would have eaten a slice of this pie if it had been set in front of me. Rhubarb is plentiful here in the midwest in springtime so I’m sure I had at least seen it around, but likely viewed it as a dubious form of celery, which I knew I hated. A bunch of raw rhubarb instilled no positive feelings or optimism in me when I considered it in a dessert capacity, because I knew nothing of its unique tart flavor and amazing texture once cooked. The sweet-tart play in strawberry rhubarb pie filling is delightful to me, and I’m glad I finally came around to this classic dessert. 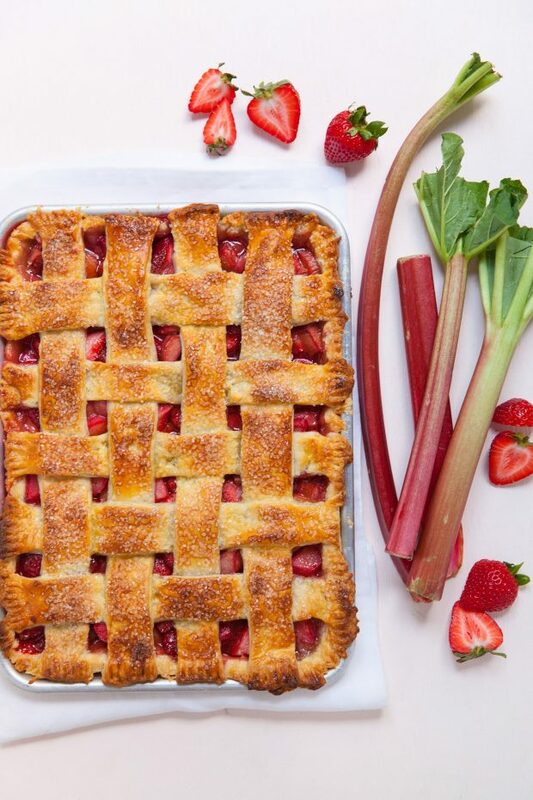 When I came across some of the early local rhubarb this season, there was no question it was destined for pie. Slab pie seemed a perfect choice because, with its higher crust-to-filling ratio, it’s like a way more sophisticated gigantic pop tart. I kept the filling pretty simple and pure in this case, but if you wanted to incorporate an accent flavor, ginger, vanilla bean, orange zest, or lavender would be lovely options. I should also add that it is simply stellar with a scoop of Jeni’s frosé sorbet. If you’re looking for a crowd pleasing dessert for your holiday weekend, look no further. Enjoy, friends! 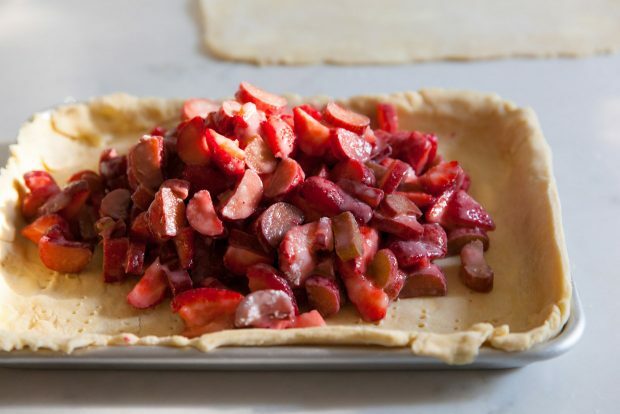 To make the filling, toss the strawberries, rhubarb, and ¼ cup of the sugar together in a medium bowl to combine. Place in a colander in the sink and let macerate for 30 minutes. This will drain off some of the liquid so that the filling isn’t too runny. Heat the oven to 425˚ F. (See note at the bottom for more baking tips and suggestions.) 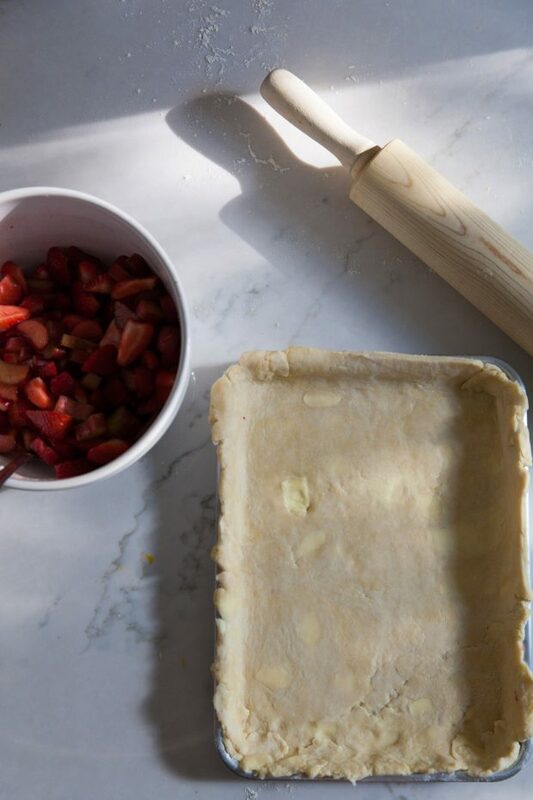 While the berries are macerating, remove the pie dough to a lightly floured work surface. Using half or slightly less than half of the dough, roll out into a large enough rectangle to fully line the bottom and sides of a quarter sheet pan. Transfer to the refrigerator to chill for about 20-30 minutes. Return the drained strawberry mixture to the mixing bowl and combine with the remaining ½ cup of sugar and the cornstarch. Stir well until the cornstarch has dissolved. Pour the filling into the prepared bottom crust. Roll out the remaining pie dough on a lightly floured work surface and create the top crust as desired. If you opt for a solid top crust rather than a lattice, be sure to cut some vents in the top to let steam release while baking. Crimp the edges of the top and bottom crust together to seal (I used the tines of a fork). Brush the top crust with the egg wash and sprinkle generously with coarse sugar. Transfer the shaped pie to the oven and bake for 20 minutes. Rotate the pan 180˚ and continue baking, about 25 minutes more or until the top crust is golden brown and the filling is bubbling. If the pie appears to be browning too quickly but needs to bake longer, top loosely with foil. Remove the finished pie to a cooling rack. Let cool 30 minutes before slicing and serving. For best results and a less soggy bottom crust, place a pizza stone in the oven while it heats. If the sheet pan is baked on top of the warm stone, it will help ensure more even baking of the bottom crust of the pie. The juices from the pie may bubble over while it bakes, so consider placing a separate flat baking sheet underneath the quarter sheet pan. If you are using a stone, this baking sheet would be between the stone and the quarter sheet pan to avoid a sticky mess on your baking stone.